The 2017 American Liberty Gold Coin features an African American Lady Liberty. 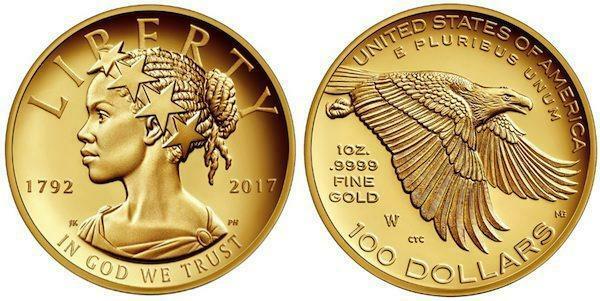 On one side of the new $100 gold coin from the U.S. Mint is the image of an eagle in flight, ‘‘with eyes toward opportunity and a determination to attain it,’’ a news release on the coin states. 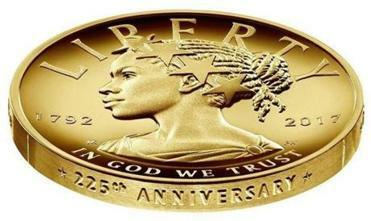 The 2017 American Liberty 225th Anniversary Gold Coin, which will be released in April, marks the first time that Liberty will be portrayed as a black woman, at least to the best of the U.S. Mint’s knowledge. In her remarks earlier this week — during a kickoff the Mint’s anniversary celebration - Basnight noted that ‘‘we like to say at the mint, that our coins are the metallic footprints of our nation’s history,’’ and symbolize what America values and honors. In a blog post, Rhett Jeppson, principal deputy director of the U.S. Mint, wrote that this gold coin reflected both the past and future. The $100 gold collectible coin is part of a series that will ‘‘depict an allegorical Liberty in a variety of contemporary forms-including designs representing Asian-Americans, Hispanic-Americans, and Indian-Americans among others — to reflect the cultural and ethnic diversity of the United States,’’ according to the news release on the coin. The price of the coins will be sold for about $1,500, Mint spokesman Michael White told USA Today. The United States Mint will release the coin in April. ‘‘Because we think it’s an important conversation for us to have, often as a Americans,’’ Jeppson said. Jeppson said that when officials were developing the coin, they wanted to be sensitive as they moved through the process. So, he said, they asked ‘‘several prominent ladies’’ what they thought.